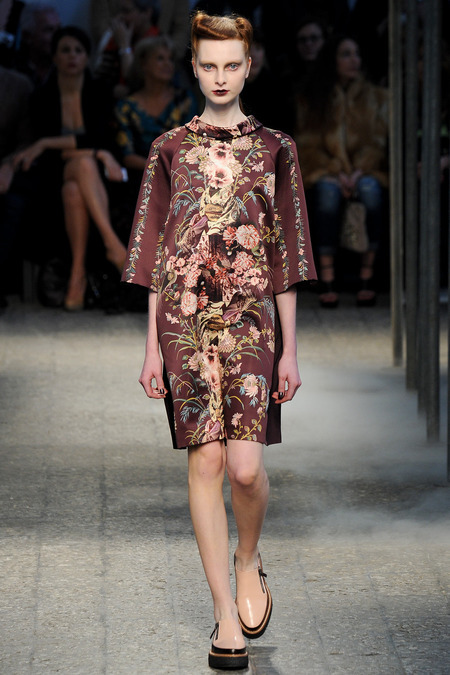 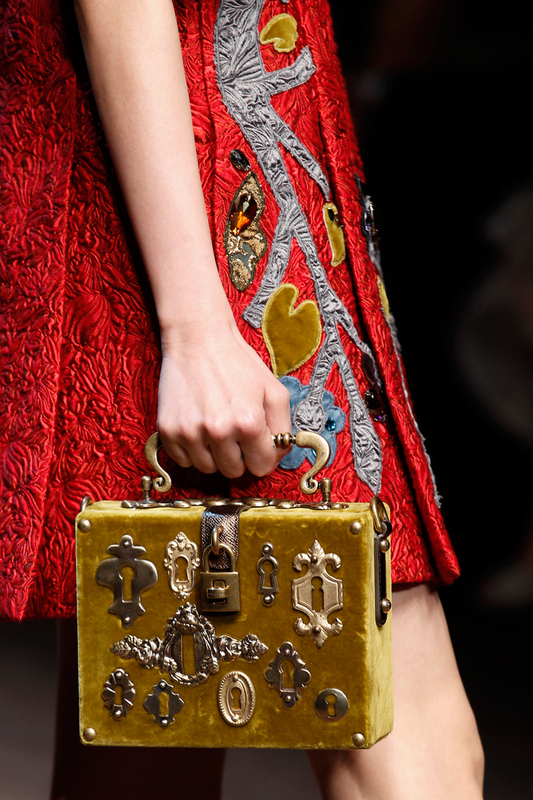 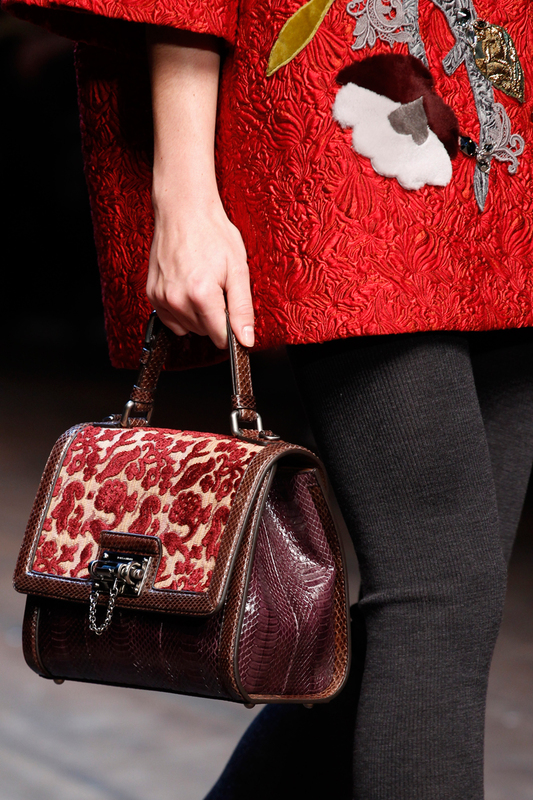 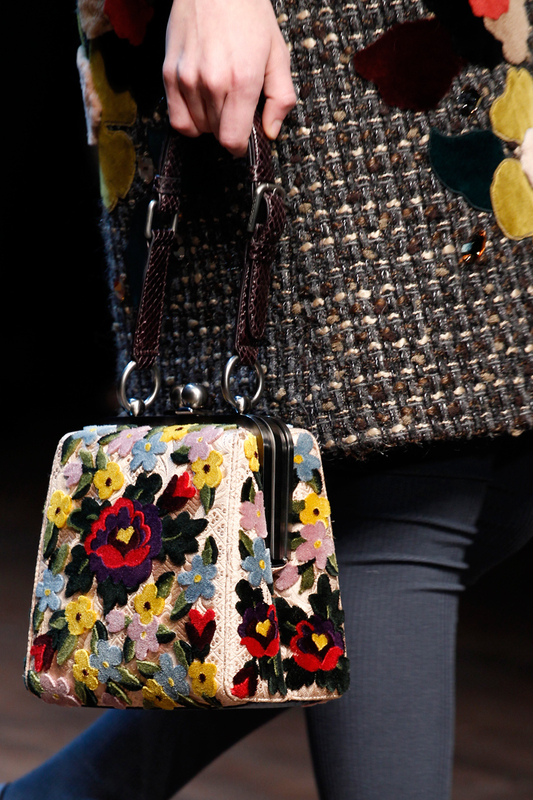 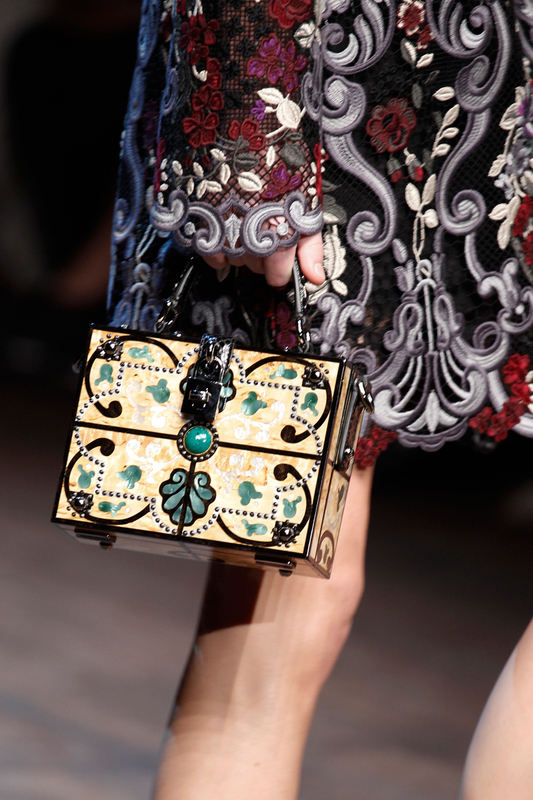 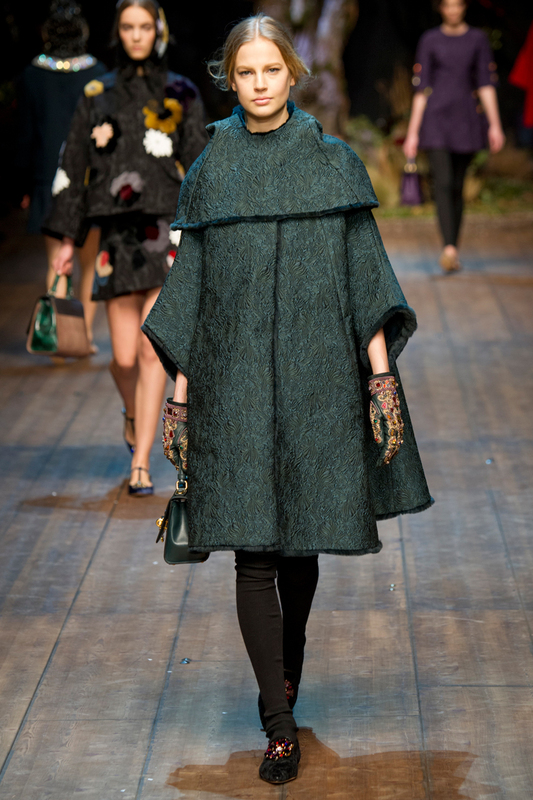 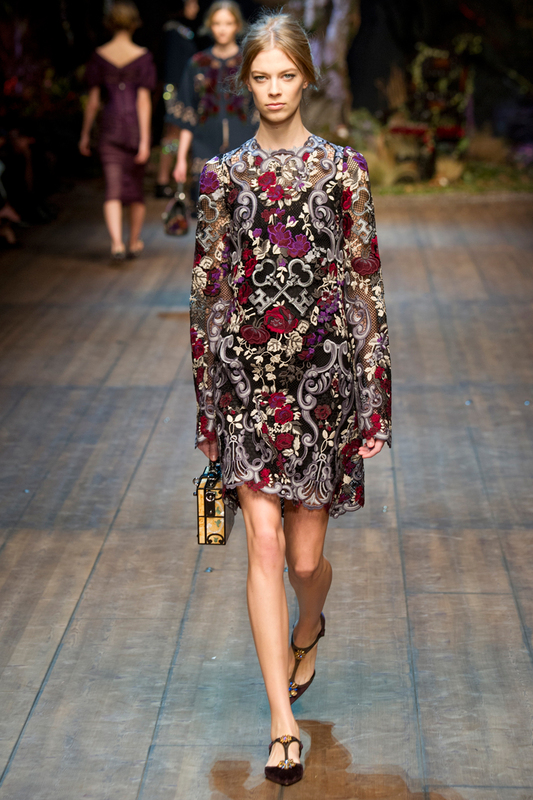 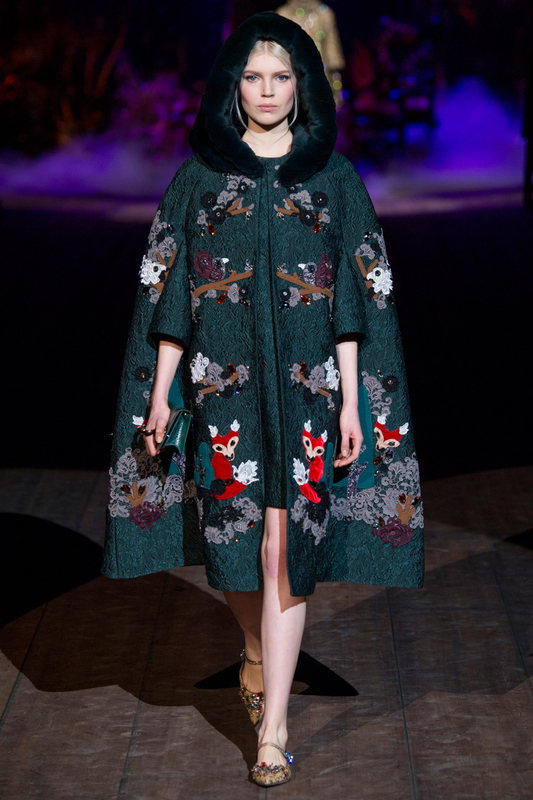 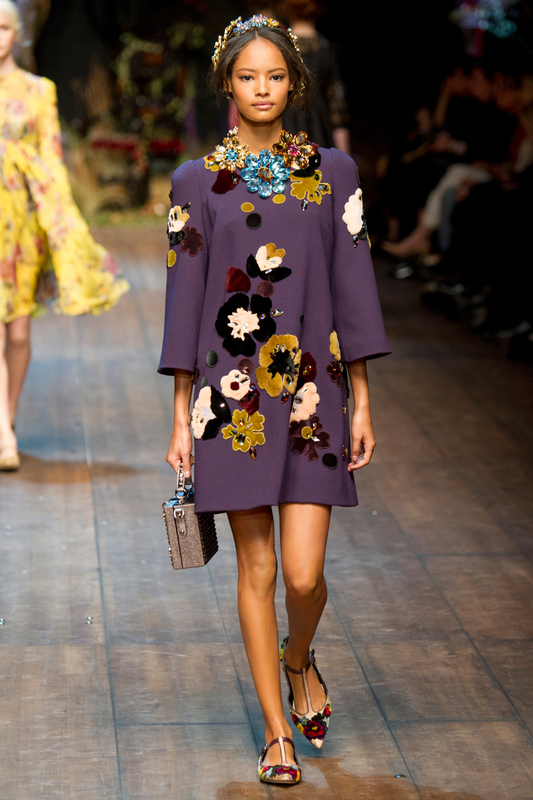 When Dolce & Gabbana decide to play with collage trend the result is truly impressive. 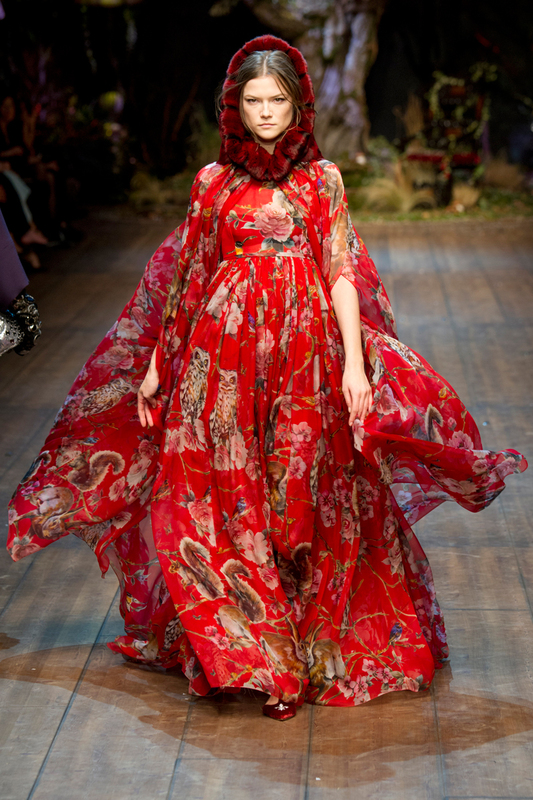 The source of inspiration was of course Sicily, but this time they invented a whole new parallel universe inhabited with beautiful creatures from their imagination. 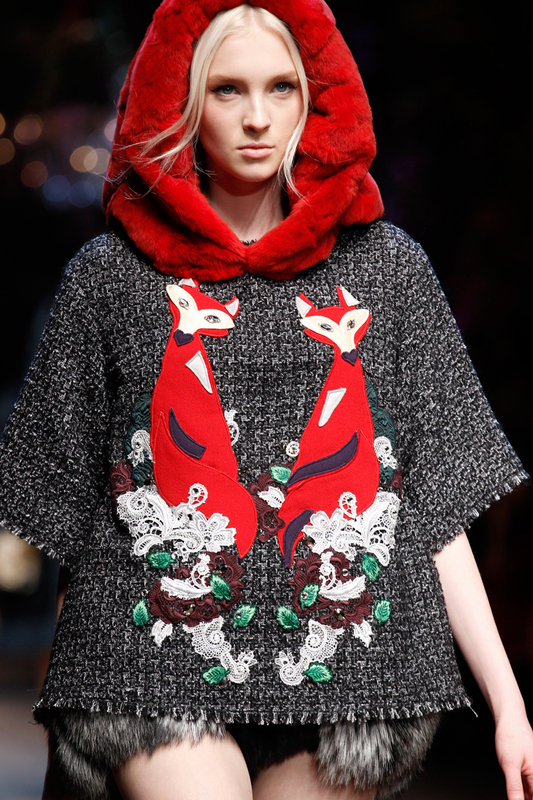 We have seen beautiful colorful appliqués in shapes of flowers, trees, apples, foxes, howls, hedgehogs, swans and squirrels. 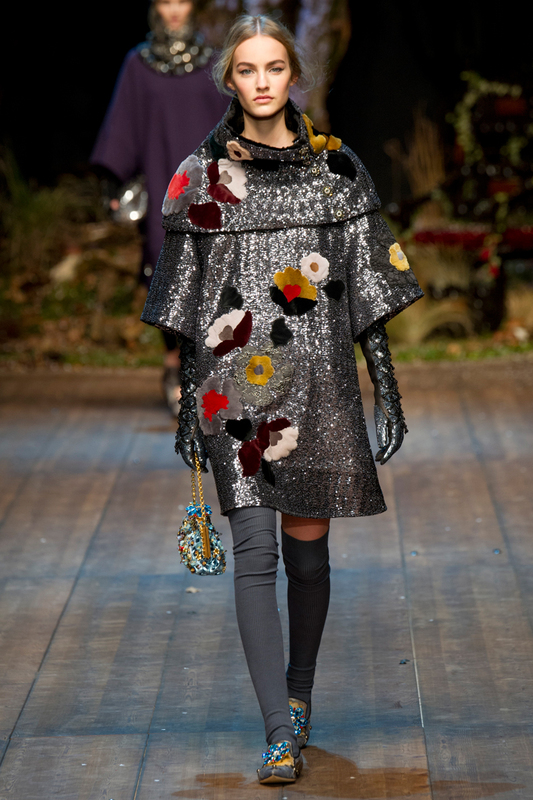 Some of their creations looked literally like children’s books while others were simply pure Dolce & Gabbana glamour crafted from silk, lace and pretty embellishments. 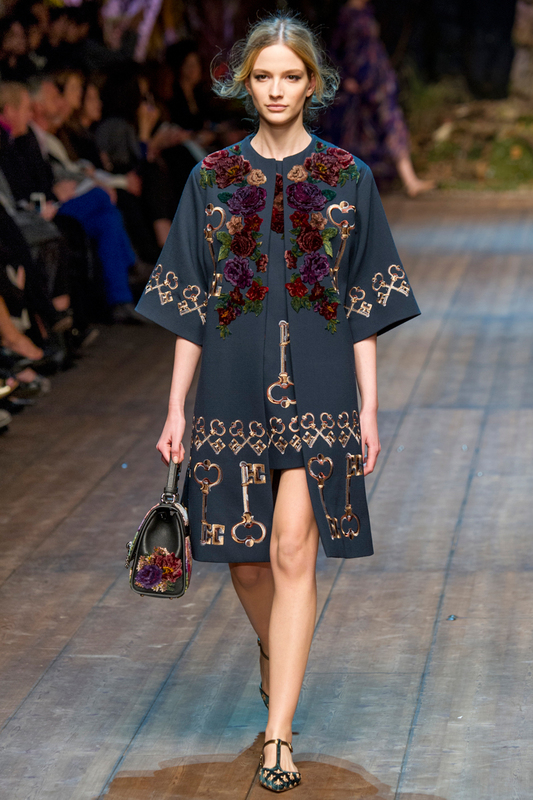 While ornaments were very rich and extravagant, the tailoring was quite simple and it all looked very effective. 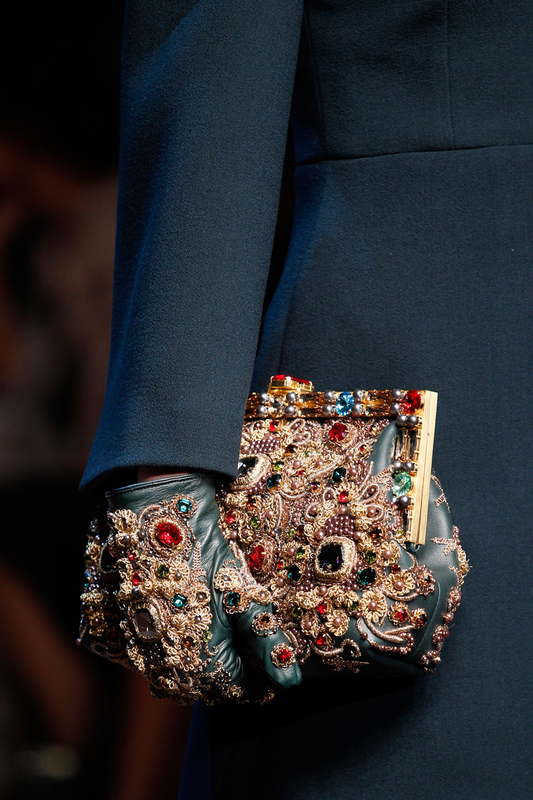 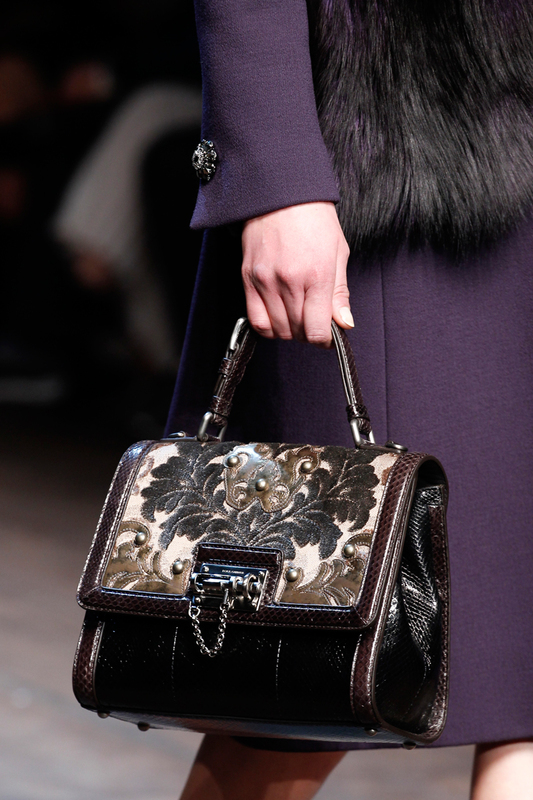 Accessories were really stunning and almost every piece is a pure fetish every girl will desperately want to have. 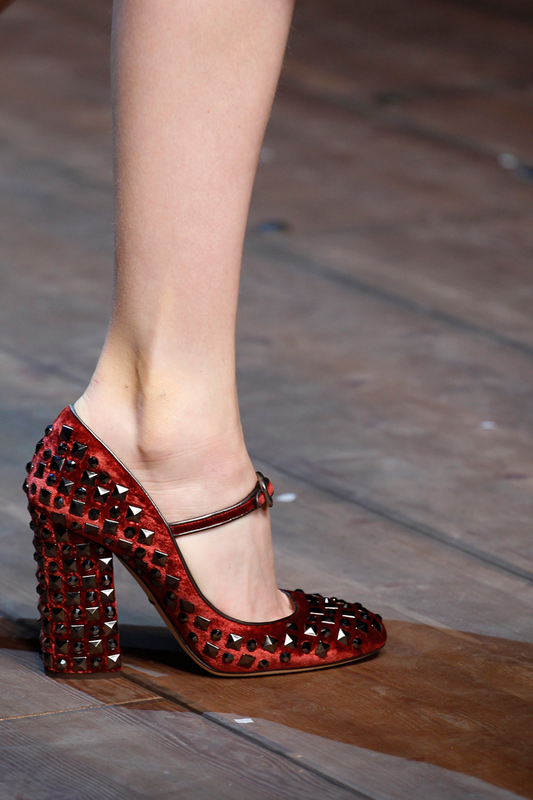 Dolce & Gabbana are well known for making incredible, perfectly shaped shoes with beautiful embellishments, and this time we have seen some cute strap flats decorated with flower appliqués and metal studs, but also their charming lady-like strap shoes with chunky heels. 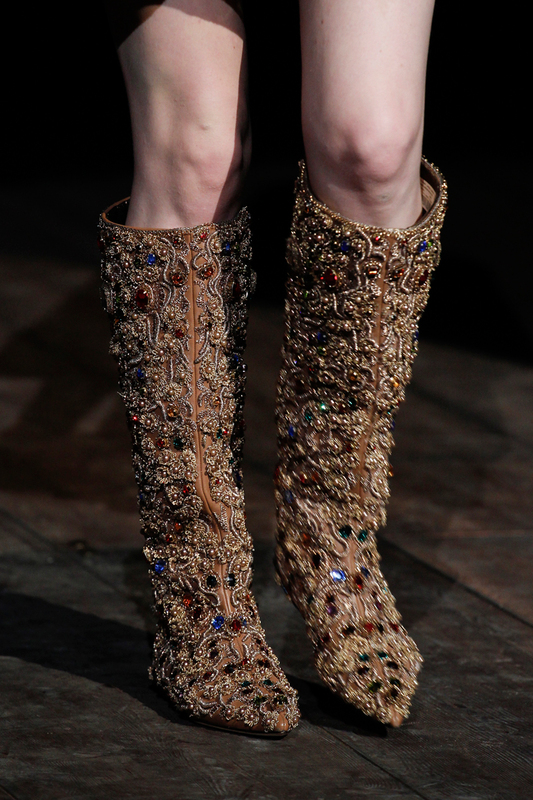 Boots were beautiful too, especially the ones covered in jewels, but the collection of handbags was absolutely breathtaking. 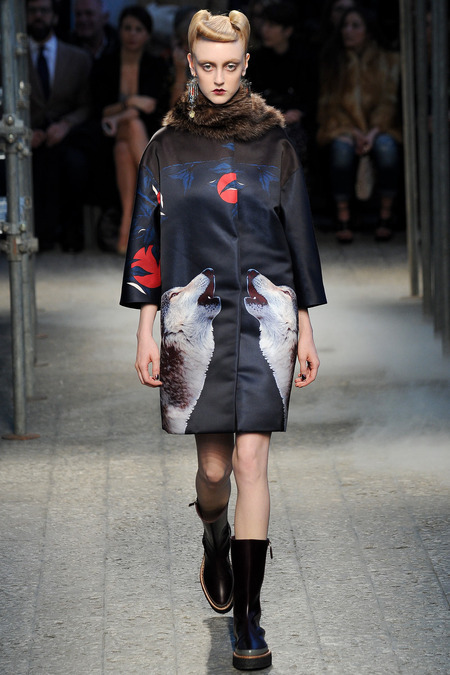 Inspired by Herman Hesse’s novel ‘Steppenwolf’, Ridley Scott’s film ‘Blade Runner’, German writer and photographer Annemarie Schwarzenbach, Little Red Riding Hood and artist Joseph Beuys, Antonio Marras included a lot of different elements in his fall/winter collection. 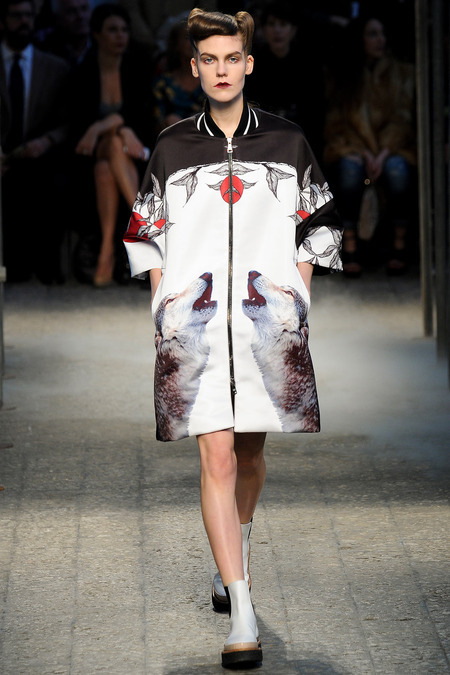 The runway was decorated with a big silver full moon and screens playing videos with wolves. 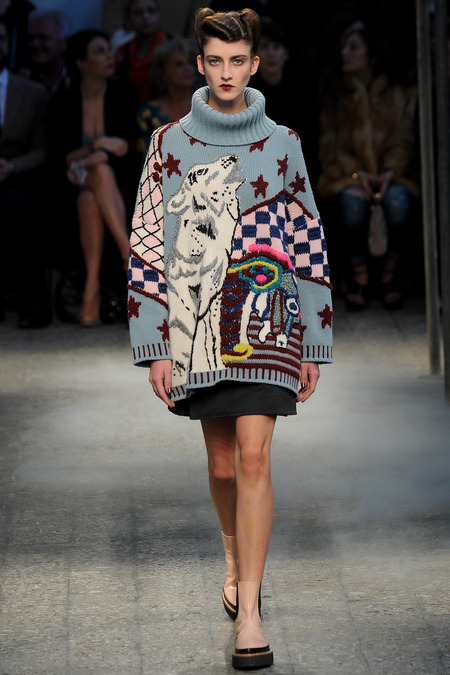 He also printed wolves howling at the moon on silk dresses and winter coats, but this scene also appears on big wooly jumpers and on skirts and tops in the form of collage appliqués. 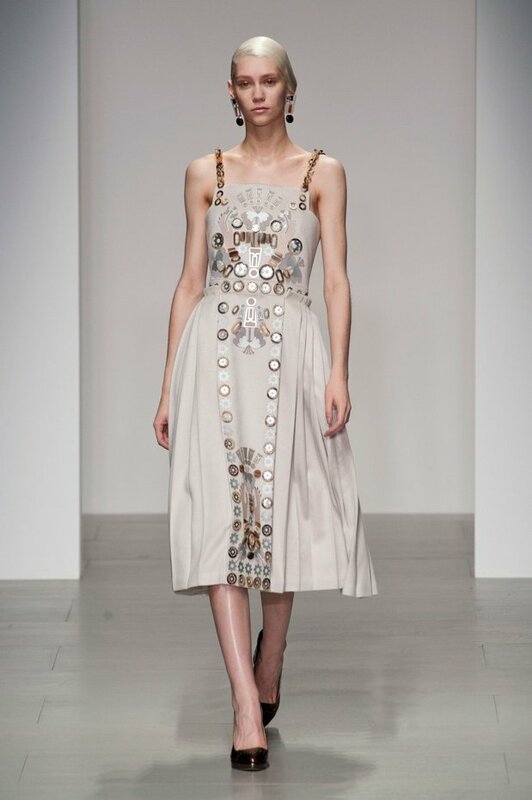 He used delicate embroidery, lace and floral prints for his feminine dresses at the end of the show, but he also made some masculine pieces with rough geometric forms. 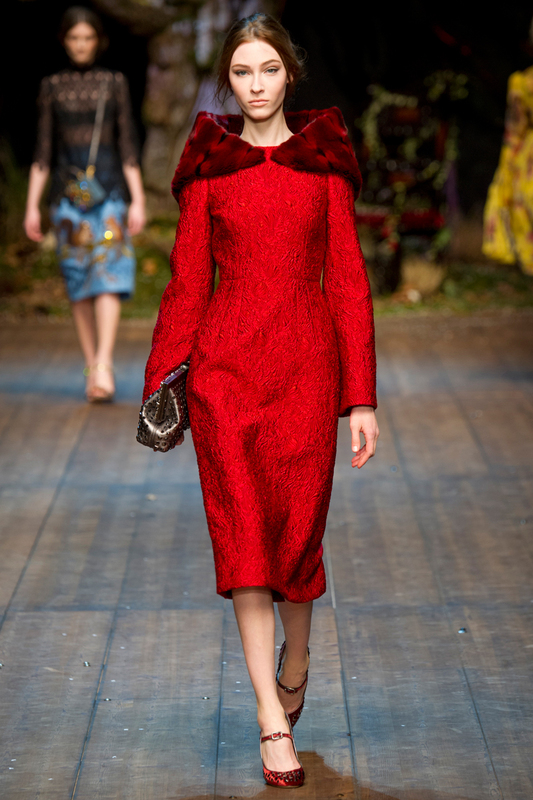 The collection had elements of horror, romantic fairytale and urban jungle, but it actually looks like a very interesting and coherent mix. 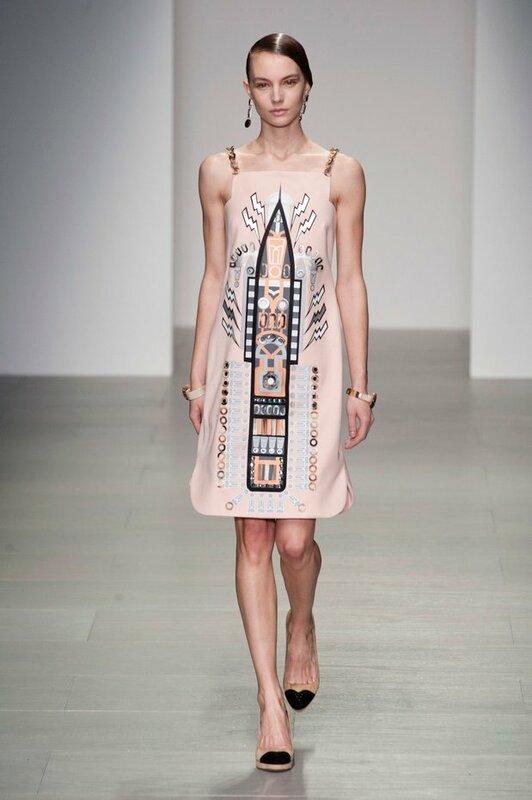 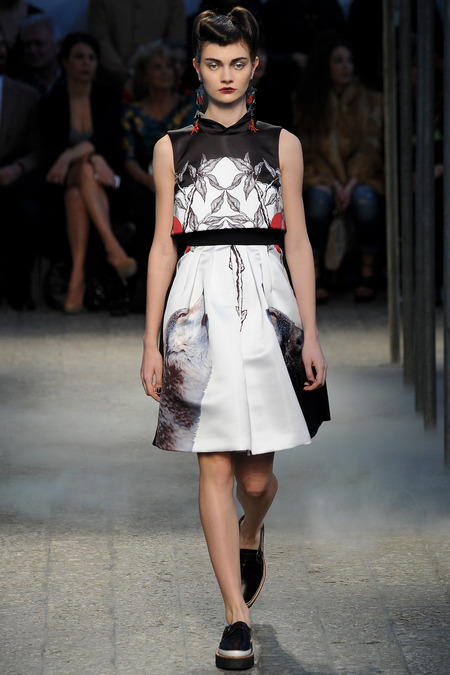 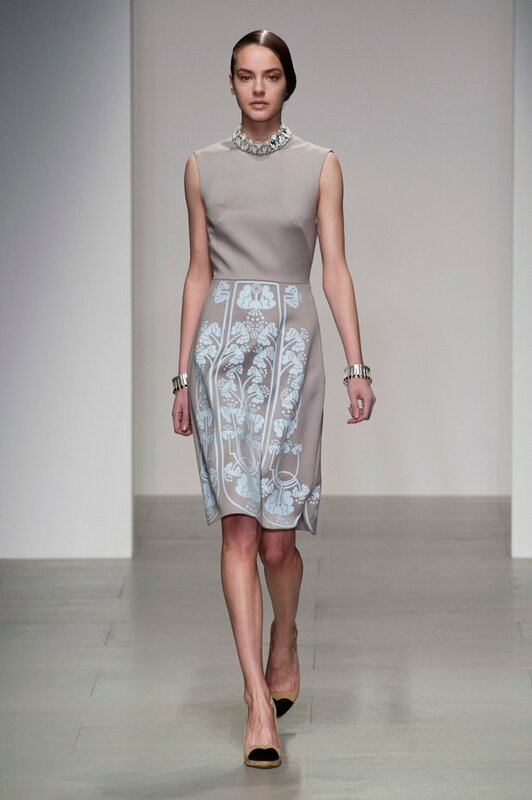 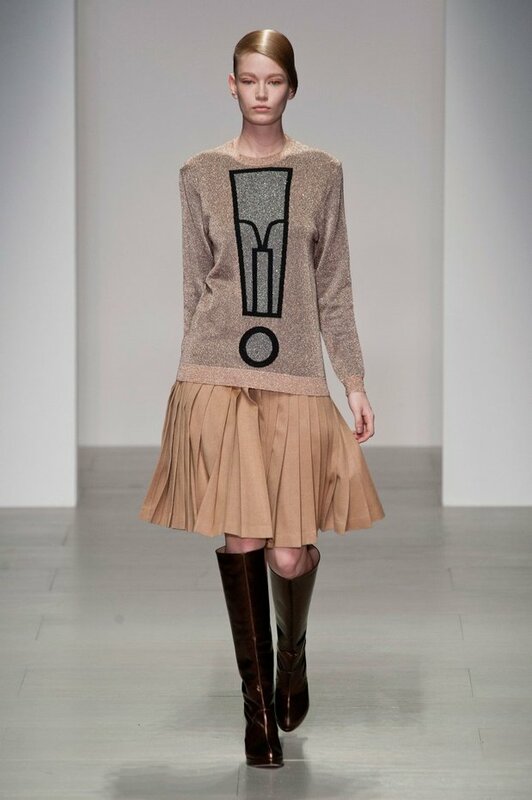 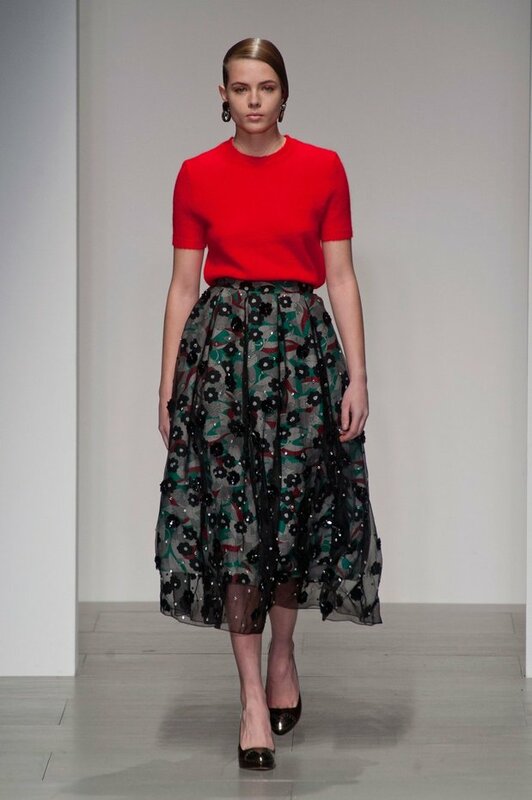 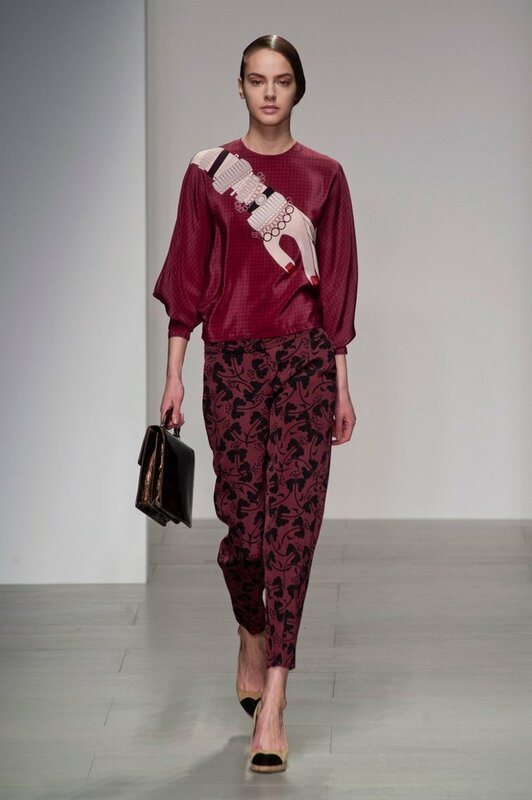 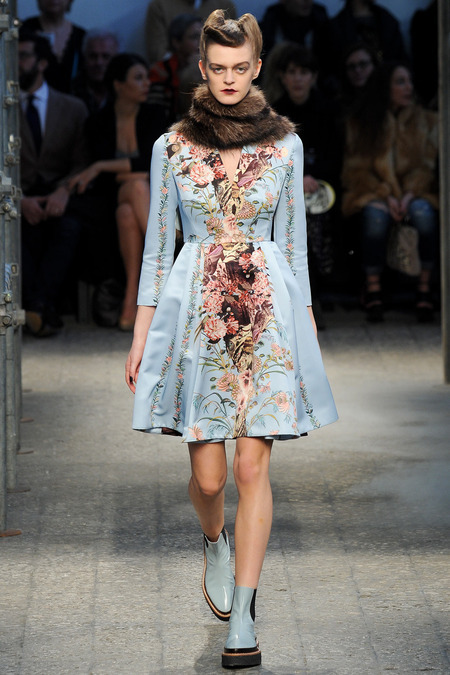 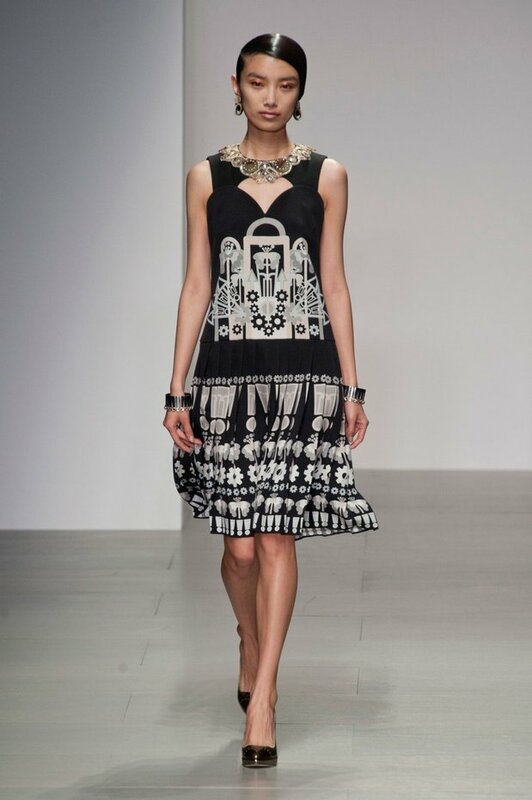 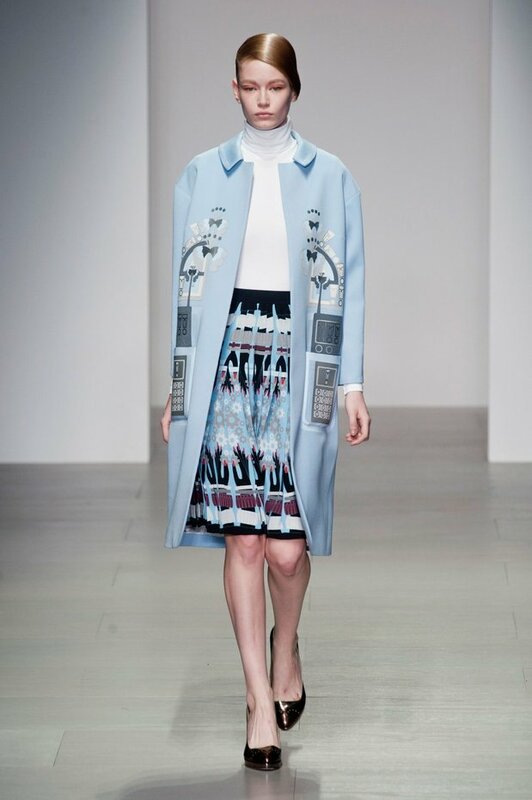 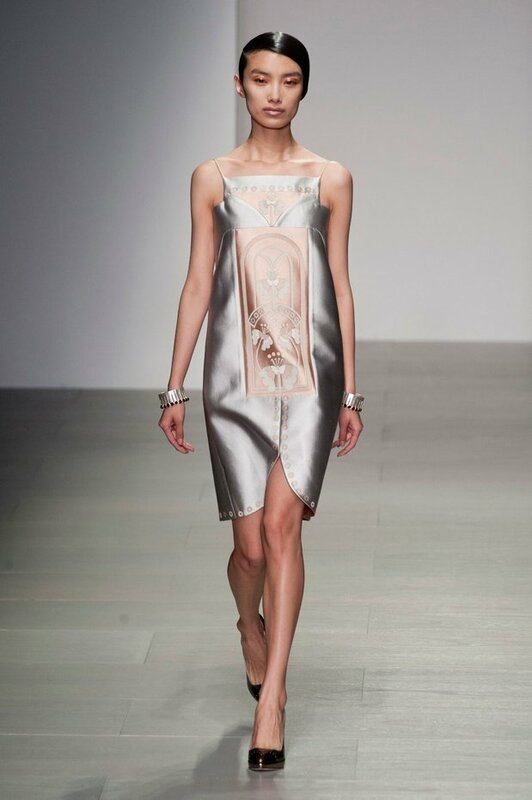 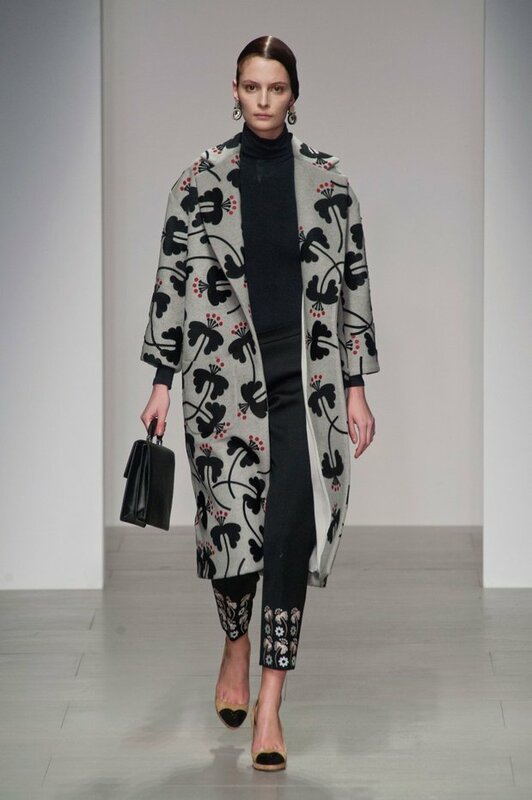 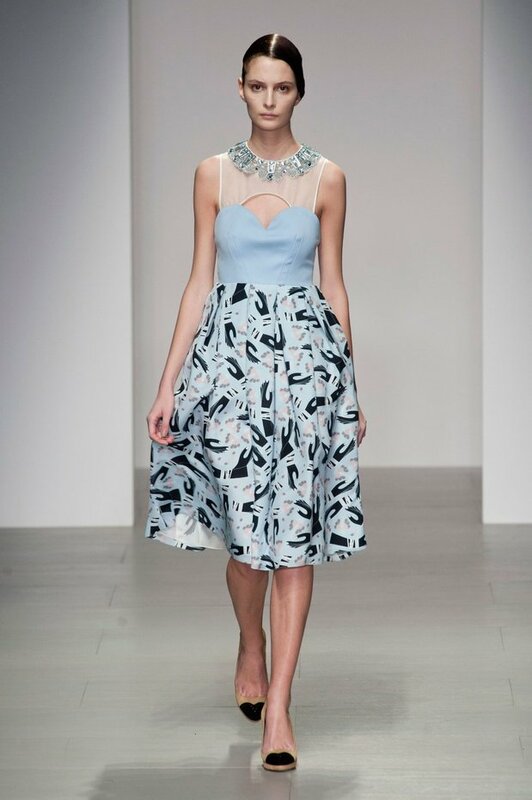 Inspired by his mother and her teenage days, Bora Aksu created a very beautiful and romantic collection. 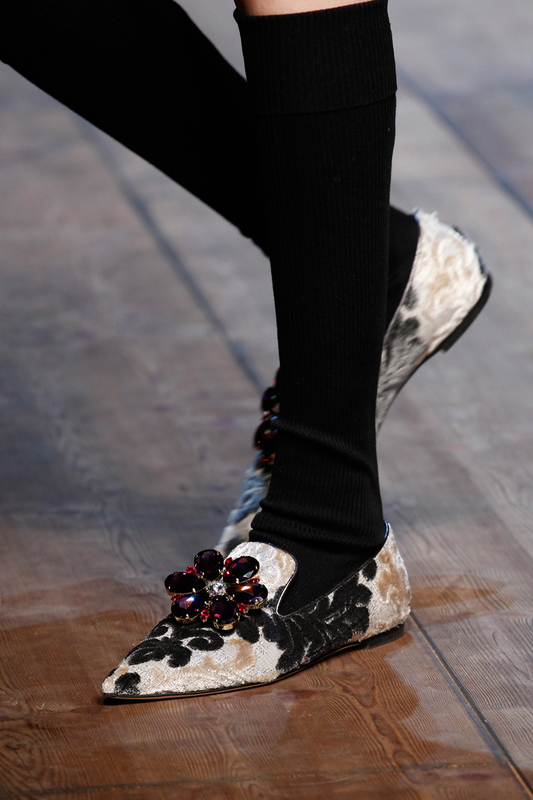 He was fascinated with his mother’s style in her boarding school days. 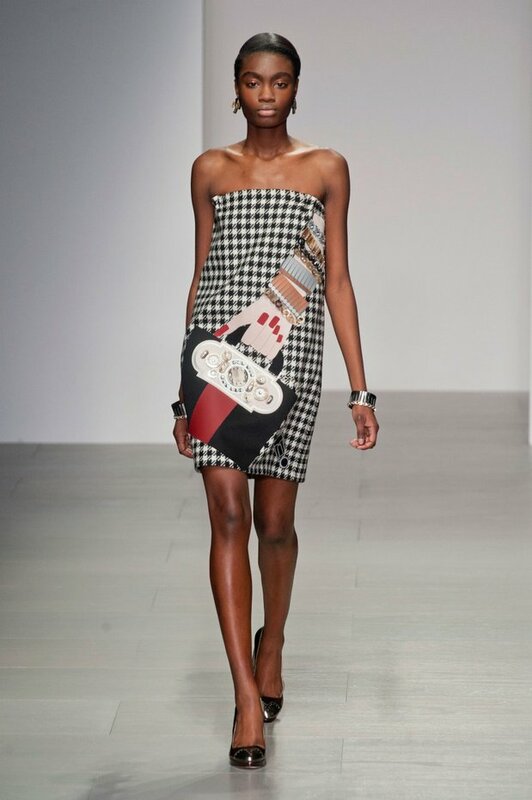 He used her letters and drawings as the main source of inspiration which is why the whole show looked so nostalgic, almost as if models walked out of an old family photo album. 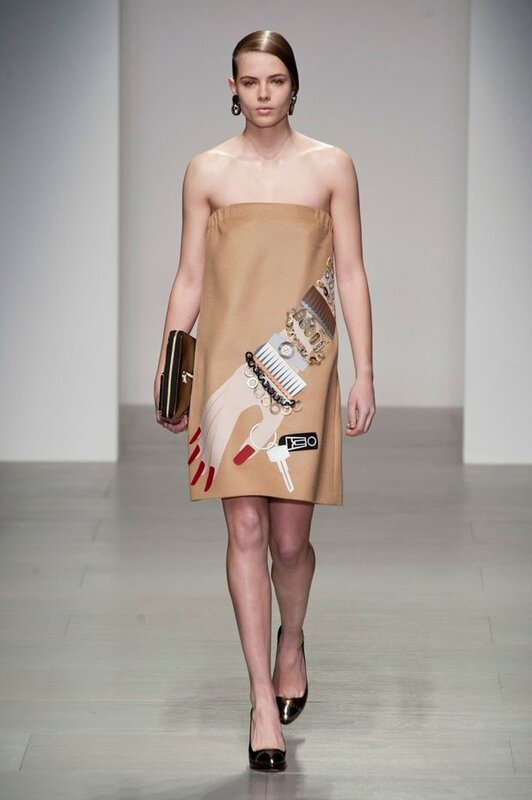 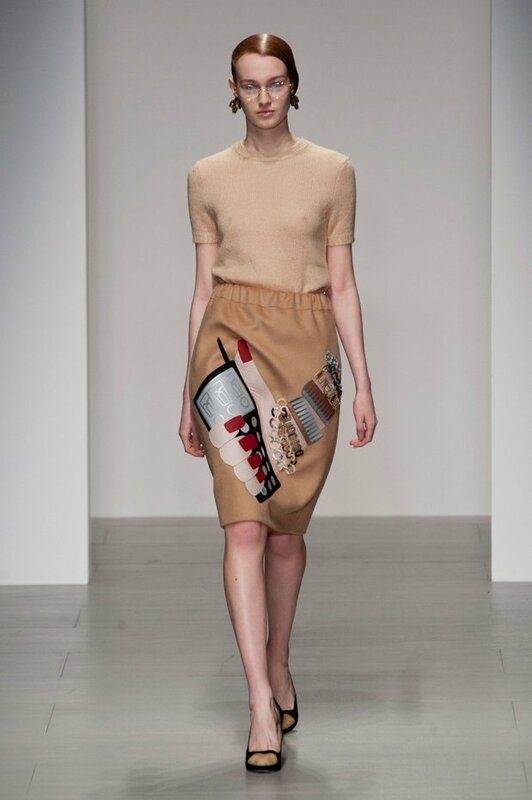 He also managed to make it modern by using hi-tech fabrics and patching them together into complex collages. 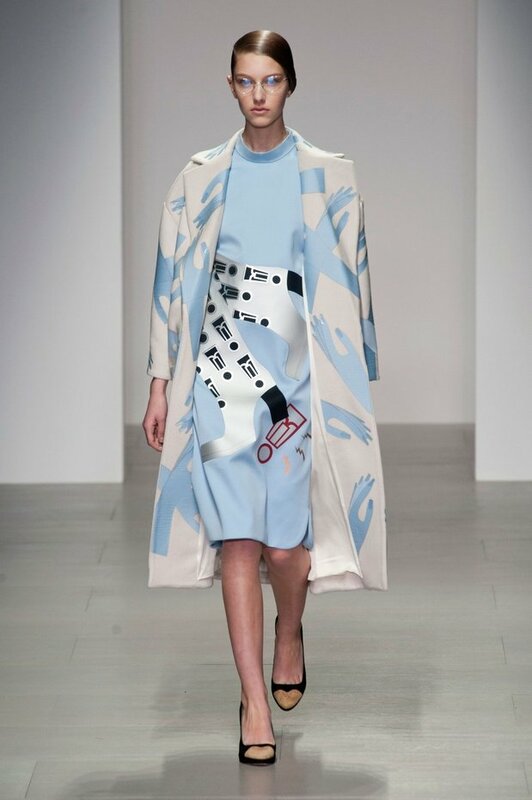 We have already seen a lot of patchwork and layering at New York Fashion Week and the trend seems to be very inspirational for many designers this season. 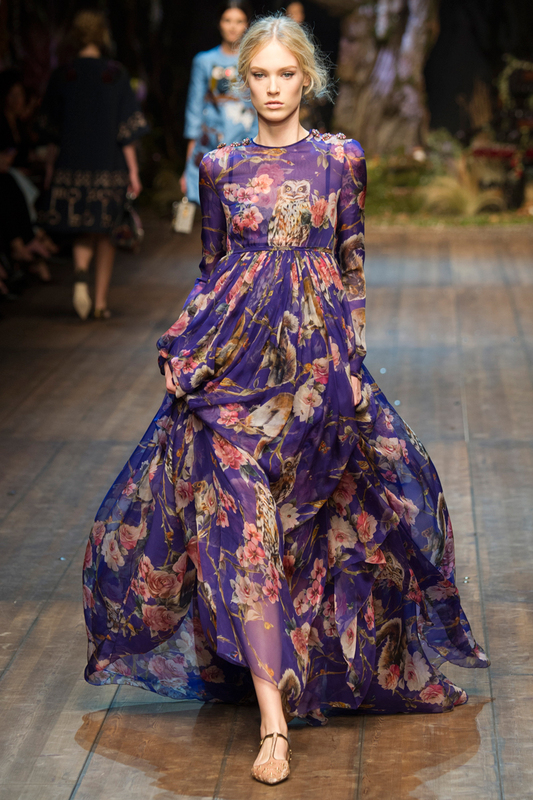 The collection is very feminine with accented waistlines, puffy skirts, bows and ruffled edges, while the color palette ranges from bold red, yellow and navy to pale pink and blue. 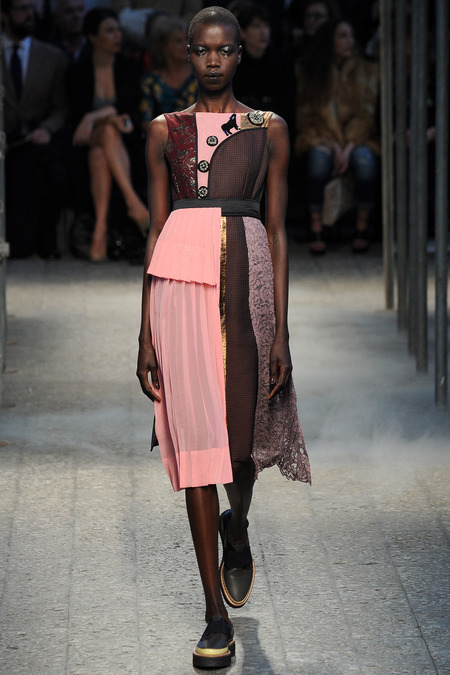 Hair and makeup are innocent and girly: braids fastened with ribbons and natural pink lips are perfectly matching romantic dresses.